This half growhouse is perfect for patios or balconies, or even standing on a patch of earth in the garden. Strong aluminium frame is glazed with toughened safety glass (which also provides superior light transmission and heat retention!). 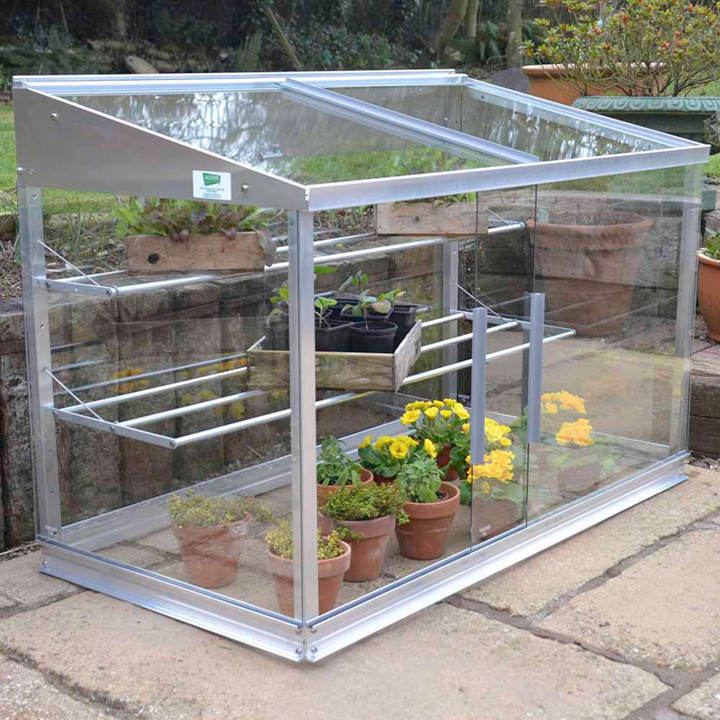 It doesn’t need to be attached to a wall and, freestanding, the glass back allows light to get to the plants at the rear ensuring better growth. Its sliding panels provide a little or a lot of ventilation, as required and, unlike some other models, there are no hinged doors to bang in the wind. It includes one wide and one narrow seed tray shelf, providing enough room overall for 16 seed trays (the shelves can be removed in summer if you require more space). Flat packed for easy home assembly. Length: 1.21m (4’); depth: 0.65m (2’2”); height: 0.82m (2’8”).